My last post before the New Year and what better way to wave goodbye to 2012 than by wearing the perfect pair of glitter frosted heels! The blush pink sued complimented by the silver glittered heels make a perfect pairing for any subtle or neutral outfit that needs a splash of pizaz! 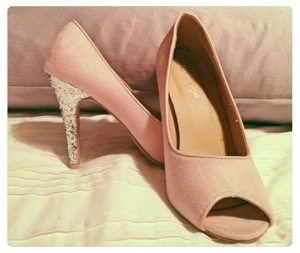 I found this particular pair at Mr Price for just R159 – what a steal!